With more than a decade of automation expertise under our belts, we know how to build an automation and orchestration platform to meet the growing demands faced by today’s ITOps, NetOps, and SecOps teams. In fact, more than one million automations are powered by Resolve on a daily basis… many of which go well beyond what you imagine is automatable. We know it sounds impossible, but it’s true. Just ask the customers who have cracked the code on tough automations like PIM testing, updating active load balancers, CUCM onboarding in seconds, true end-to-end patch management, interacting with Watson for NLP, maintaining infrastructure in segregated networks, and more. Keep reading to see how we do it. Automate all of IT with the Resolve platform. We're a Little Different from Other Automation Solutions (If You Haven't Already Noticed). Let's separate the signal from the noise. We take a different approach to automation. Our platform is designed to provide the adaptability you need to automate everything from simple tasks to complex processes that don’t fit the norm — including those that cross IT silos and environments. It sounds easy, but we think you’ll find most tools can’t actually do what we do. We know it's tough to cut through the buzzword bingo with automation vendors using similar terms to describe very different functionality... so here’s an attempt to explain how Resolve approaches automation in words even your mom can understand. Get one unified IT automation platform that supports you at every stage of the automation journey. 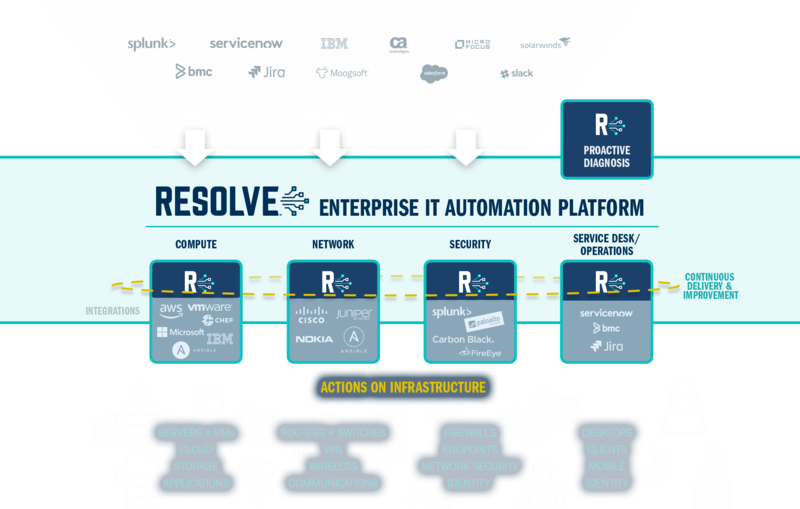 Resolve was architected from Day One to overcome IT silos and to offer the flexibility you need to automate everything from the simplest high-volume tasks to the most complex processes across your entire IT ecosystem — from your hybrid compute infrastructure to your network, security, service desk, and beyond. This enables us to automate things you never thought were possible, including complex processes that touch multiple technology stacks and environments, that cross your cloud and on-prem infrastructure, that require actions to be taken on both network and compute components, and that impact infrastructure owned by multiple teams. Resolve plugs in seamlessly across your entire IT ecosystem, so you never have to worry about rip and replace with us. We offer out-of-the-box integrations and prebuilt automations that support hundreds of products from your favorite software, hardware, security, networking, cloud, virtualization, operating system, and task automation vendors. 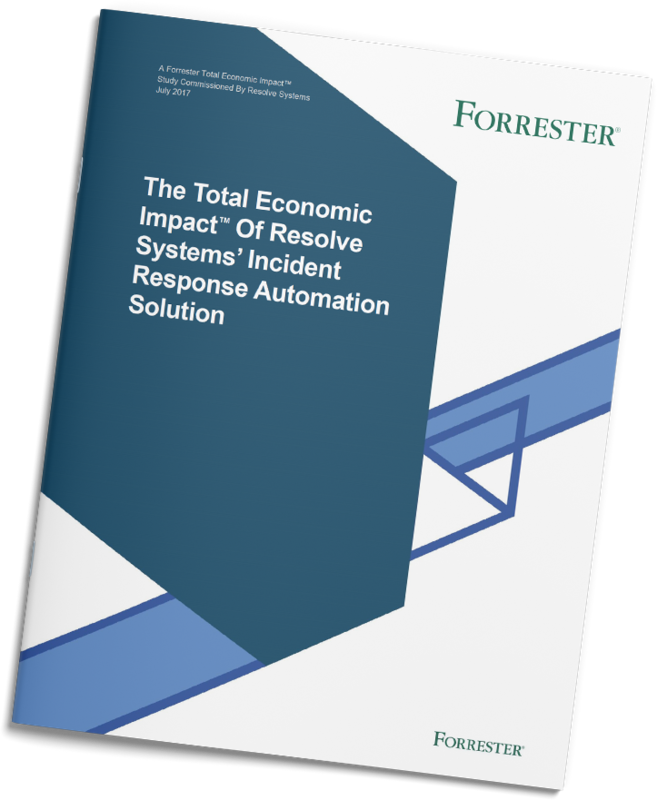 Fire up an automation in minutes so you can achieve ROI almost immediately. We don’t think a blank page is the best way to get started when you want to build a new automation, even if you need to customize it for your unicorn processes. And oftentimes, that blank page is the death knell for companies who are trying to onramp automation into their IT processes… we don't think getting started with automation has to be that hard. With Resolve, it is super-fast and easy to build new automations, regardless of whether it’s your first or your 500th. We provide you with thousands of prebuilt automations (aka, runbooks) that have been developed over a decade of working with the largest enterprises and service providers to automate every aspect of their IT environments. 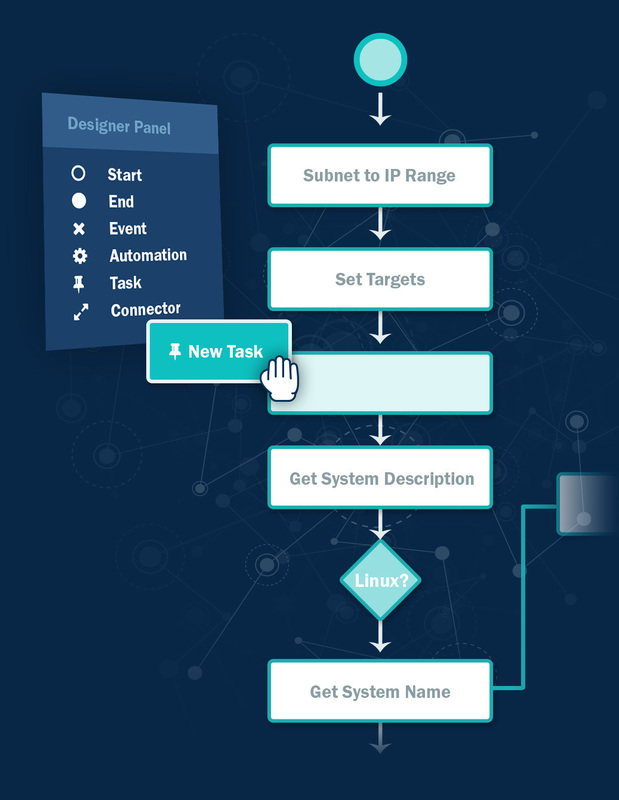 Simply search our extensive library from within the drag-and-drop Automation Designer to find the prebuilt automations you need to jumpstart an end-to-end automation or string them together to build out a more complex workflow. Each of the prebuilt automations can be easily customized with a few clicks to meet your unique needs while getting you up and running in no time. Let people make the tough decisions while the machines automate thousands of steps in between. We’ve been in the automation business for a long time, and we totally understand that the best automation empowers humans, rather than replacing them. 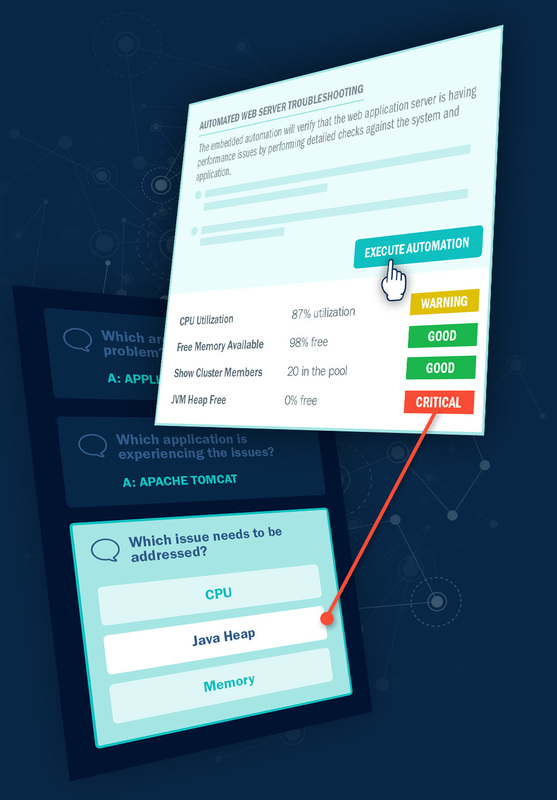 With Resolve, you can enable people to focus their attention on critical thinking and tough decision making, while letting our platform handle the repetitive stuff. 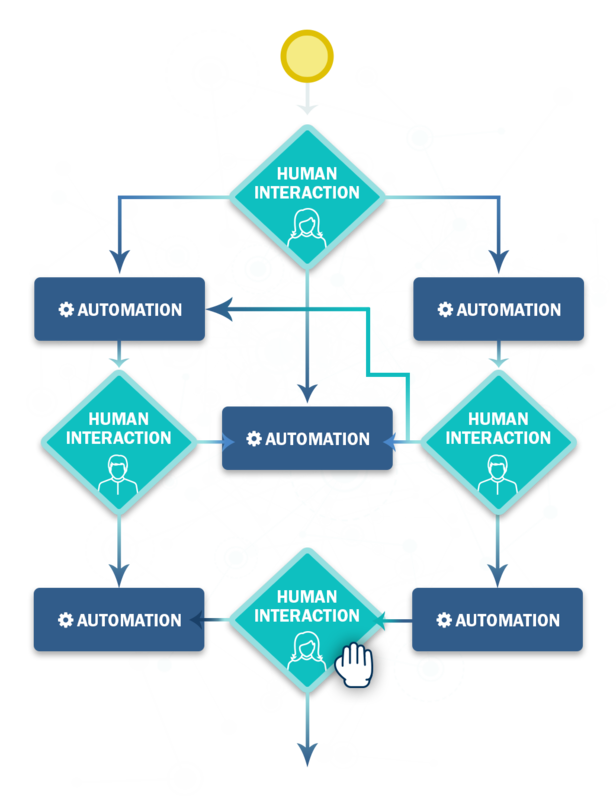 Our unique, interactive automation capabilities overcome the limitations of rigid automation tools by allowing you to choose exactly which steps of a process are automated and which ones require human interaction. Want to have approvals built into an automated change management process that involves more sensitive aspects of your environment? No problem. Want to include numerous decision points in a more complex, multi-step automation that requires detailed oversight? Yeah, we can do that, too. At key points within a complex workflow, interactive prompts appear alongside contextual information and diagnostics, which are automatically gathered and presented in easy-to-read dashboards by Resolve from across your locations, environments, and systems. This data ensures you have all of the information you need to make an informed decision, without needing to log into multiple systems or beg for access. Additionally, Resolve presents guidance captured and memorialized from subject matter experts (more on that below) to enable agents to make decisions on next steps without escalating. With the power of interactive automation, you can automate the most complex processes with confidence as your automations get more sophisticated… or start small and dial up the automations as you gain more trust in the system. Ready to have the best of both worlds? Give your humans the automation they deserve. Our graphical Automation Designer means you can automate with little to no code. We know that one of the biggest barriers to adopting automation is the amount of coding some tools require. Our platform provides a graphical Automation Designer that makes it easy to build automations without code. Subject matter experts can use the drag-and-drop interface to quickly design process workflows, build decision trees, and add pre-built automations from our content library without writing a line of code. Of course, if you do have developers who crave code-level flexibility, we make it easy for them to code everything in the process with simple Groovy or Python. And, if you want a little of both, simply toggle between the interfaces. 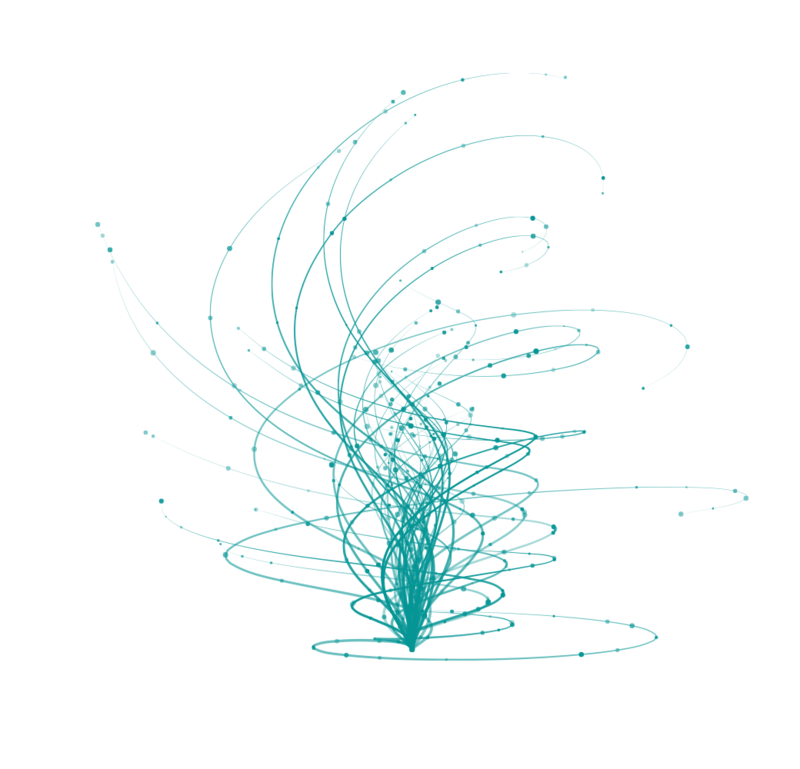 Decision trees and knowledge-capture tools enable you to catch lightning in a bottle. Detailed technical and process knowledge oftentimes exists solely inside the brains of your overburdened subject matter experts (SMEs). That knowledge has to be documented in order to design successful automations, as well as to empower Level 1 agents to resolve incidents on their own without escalation.  Resolve provides easy-to-use tools that enable SMEs to capture tribal knowledge that can be easily converted into automations and shared procedural expertise that combines incremental automations with step-by-step instructions. With our graphical Decision Tree builder, SMEs can document and design conditional logic that guides less-experienced agents through best practice procedures that pull in pre-built automations that overcome common hurdles related to system access and permissions. Plus, you can rest easy knowing that all of the actions will be safely executed in accordance with pre-approved procedures. 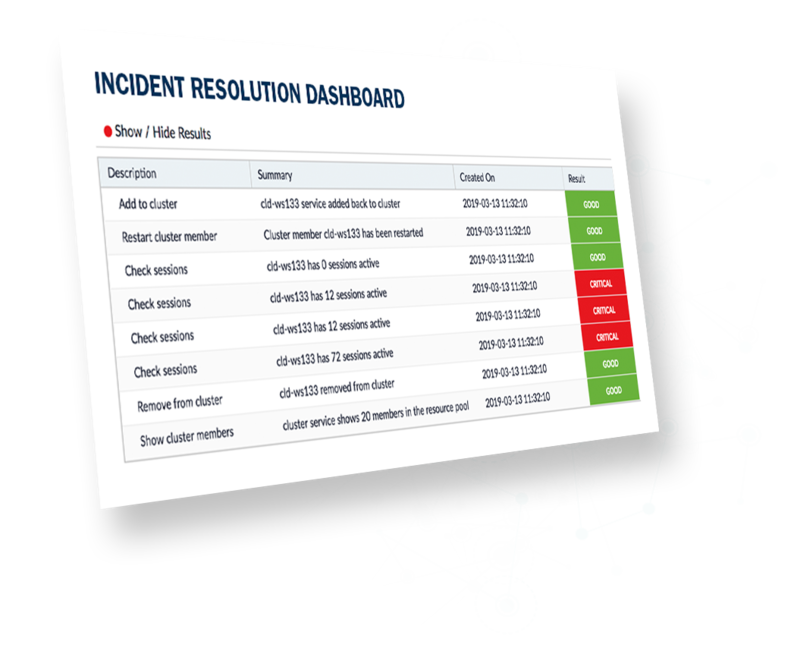 Spot problems immediately to aid in incident resolution & keep an eye on what’s happening under the hood of your automation platform. When incidents occur and alarms are triggered, you need answers fast. 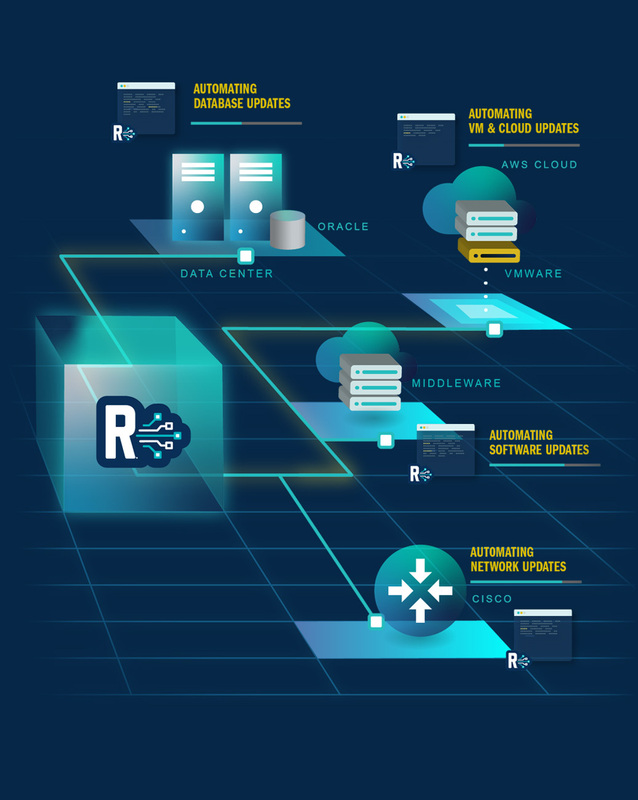 Resolve automatically collects data from across your systems, environments, and integrated tools and presents it in easy-to-read, color-coded dashboards. In addition to eliminating hundreds of hours of manual effort and time in the swivel chair to gather data points from multiple places, these auto-generated dashboards enable you to quickly spot issues (pro tip: look for the items in red) and accelerate incident resolution with end-to-end automations, interactive automations, or guided procedures. 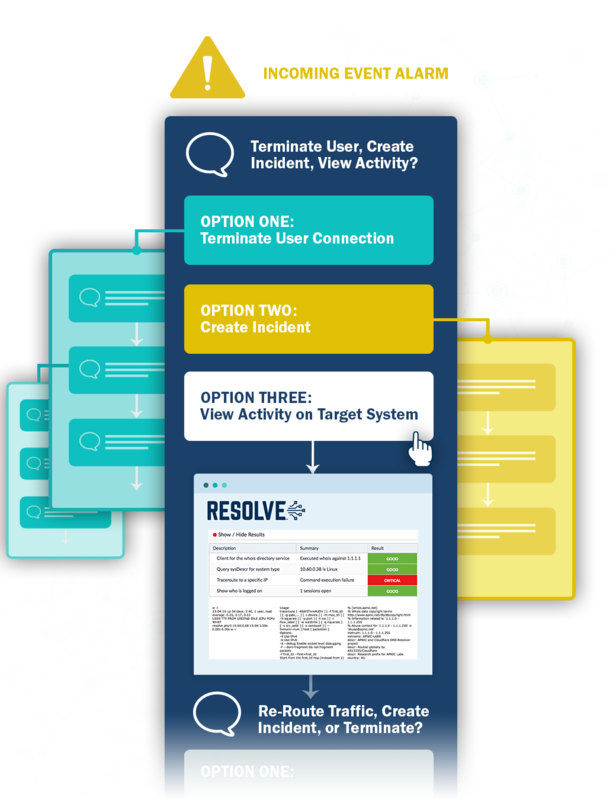 Just click on critical items and automate your way to the fastest incident resolution on the planet. 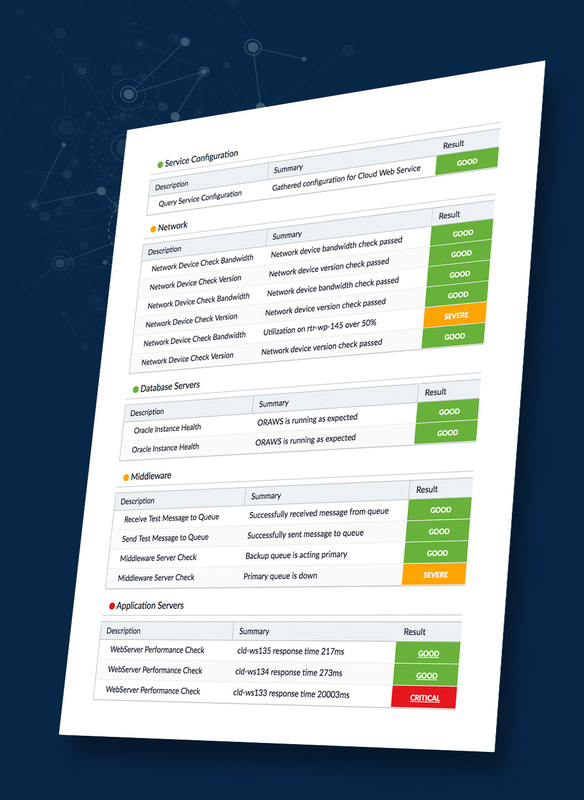 Dashboards in the Resolve platform also enable you to review the outcomes of all automations that are running, including those you set up proactively to stay ahead of problems. For example, let’s say your boss wants to get a comprehensive report card every day showing the health of your hybrid cloud infrastructure. It’s no biggie with Resolve; simply set up the proactive health checks you’d like to run every day and Resolve will generate a dashboard that enables you to keep an eye on your infrastructure. Additionally, dashboard views give you real-time visibility into automations that are running right now, so you can always get at-a-glance visibility into the status of the automated activities across your IT ecosystem. Maximize current investments and expand on the foundation you’ve already built. 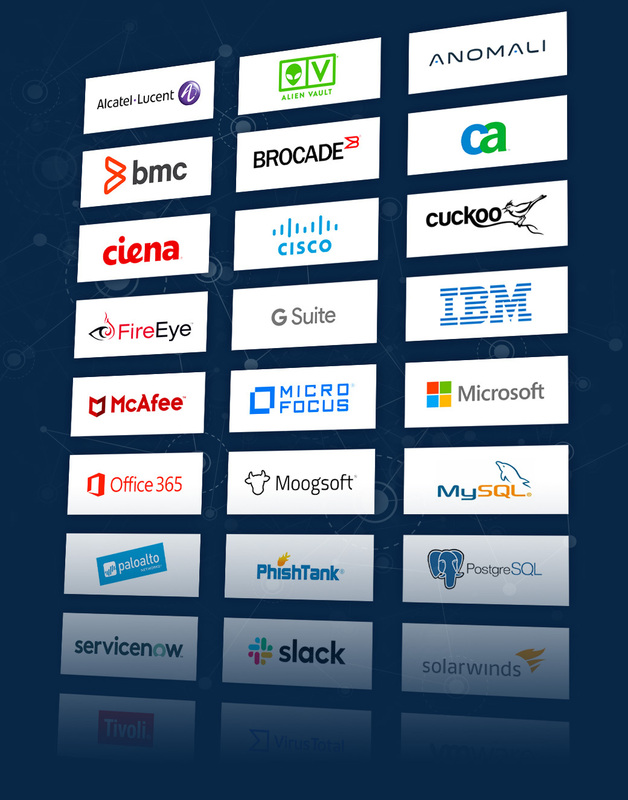 With hundreds of out-of-the-box integrations, you can easily connect Resolve to your existing ITSM and ticketing systems, event management systems, monitoring tools, enterprise applications, databases, virtualization technologies, network devices, cloud environments, identity management tools, operating systems, firewalls, SIEMs, and more. Got custom stuff or new apps that you need to integrate? We got you covered. In addition to out-of-the-box integrations for your favorite systems, Resolve can easily integrate with almost anything via REST API, SNMP, SMTP, SOAP, SSH, TCP, or other common protocols in the alphabet soup. 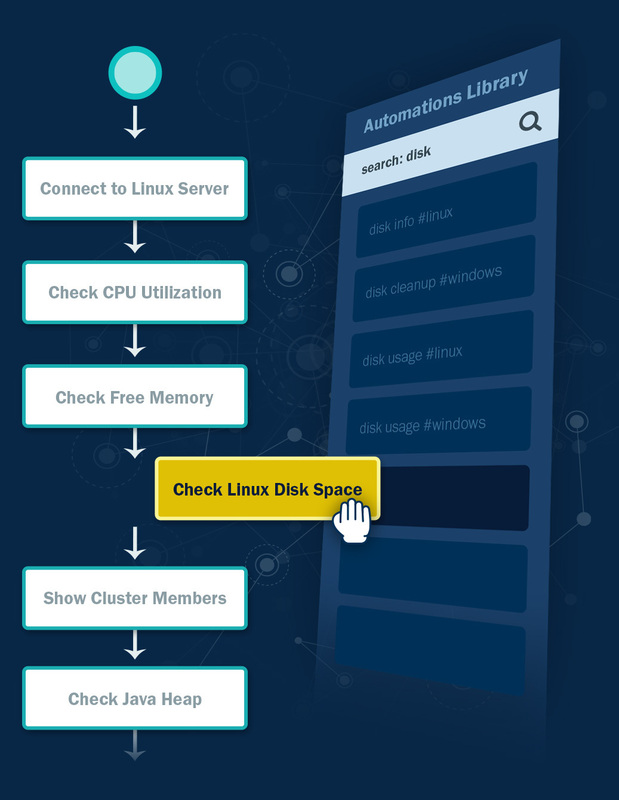 Capture every step of a procedure automatically without manually logging anything. You need to know what was done to take quick corrective actions if something goes wrong. Your auditor wants a complete record of all actions for compliance and governance. Your boss wants to analyze and optimize processes to ensure you are always improving. But documenting all those steps by hand can be daunting… so we automated it. 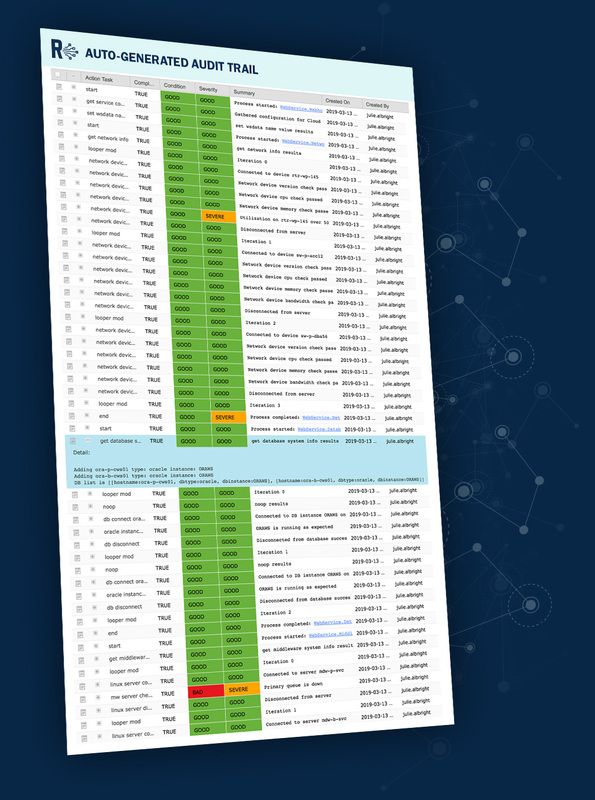 Resolve logs all actions and the results of those actions – whether automated or manual. We auto-generate dashboards that enable you to simply click for details on any given portion of a procedure. Now with a few keystrokes, you can provide your stakeholders with complete visibility into all actions that were taken. We give you the detail you need without manually logging anything! Our platform runs millions of automations and processes thousands of tasks each and every day. Resolve was purpose-built for automation at scale so it can handle whatever you want to throw at it, now and in the future. Our customers range from the largest telcos in the world (who need to process millions of events every day with Resolve) to global MSPs (who run tens of thousands of automations every day on multi-tenant environments). Whatever you want to automate, we're here to make it happen. What do you want to automate with Resolve? The automation options are endless. But just in case, we've put together a few solution pages to show you a sampling of what we can do. Ready to chat with one of our automation experts? Simply request a demo!